8W August 1998 issue, offers are kindly accepted to extend the length of this article! Young Jacques' eponymous uncle was hardly a class act and never looked like washing away the memory of his famous brother. His F1 career entirely consists of three non-qualifying appearances of which this is the last. In 1981, Arrows signed him for the two end-of-season North American races, as a replacement for Italian Siegfried Stohr, but on both occasions he never looked like qualifying. In 1983, he got a single RAM chance as a go-between in the second entry, but the car was hopeless, borne out by the fact that the more talented Jean-Louis Schlesser and Kenny Acheson also failed to qualify the car all year. 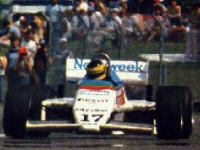 This JV did however win an Indycar race once (Elkhart Lake 1985) but this owed more to luck than to skill. Jacques Villeneuve attempted for the second and last time to qualify for the Canadian GP on the track now named after Gilles. Gilles had been the first Canadian to win a F1 race at this same track in 1978. The car is a March design built by the RAM team during one of the lowest points in March's F1 history. After having missed the Detroit GP a week earlier because of sponsorship troubles, the car was flown to the Mosport race track near Toronto so that JV could test it. He had won the Can-Am sports car race at this track the previous week. However when he tried to qualify for the GP in Montreal he could not get enough heat into the tires during the official qualifying session and failed to make the grid. Unfortunately his times during the free practice would have been good enough for a position on the grid. In a rather macabre piece of irony it was the #17 Rothmans March driven by Jochen Mass that Gilles Villeneuve had collided with in his fatal accident during qualifying for the Belgian GP the year before. Jacques would have better luck two years later when he drove a March 85C to victory at the Elkhart Lake Wisc. IndyCar race, becoming the first Canadian to ever win a race in that series. Ten years later his nephew Jacques Villeneuve would win his first IndyCar race at this same track. The younger Jacques would go on to become the first Canadian to win the Indy 500, the IndyCar series championship, and the F1 World Driver's title. A remarkable series of accomplishments in one family.